I gave up ordering and buying craft supplies for Lent. So to cheer myself up, I made this adorable Rainy Day Fund container to hold all of the $$$ I can pull together between now and Easter!!! Let me tell ou, there will be a shopping spree involved, lol. 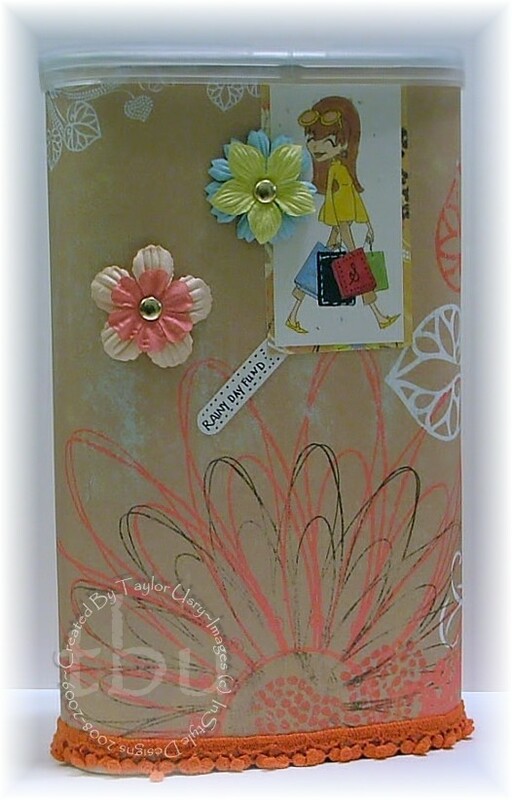 I used Prima Harmony do, flowers, and ribbon – I love it when they package it all nice for me! My image is the fabulous Miss Suzie Q from InStyle Stamps. I figured she was perfect for my rainy day fund! I love Target for many reasons, and this container is one of them. It’s Archer Farms cereal, and it is quite tasty! But the coolest thing, for me, is that it comes in this handy container, that I just knew I could turn into something Fab! What do you think? This is cute! I gave up Starbucks and plan to spend what I would have spent on it thru Easter on scrapyp supplies after Easter!